What an unexpected delight on Good Friday to see today’s excellent Deceptive Cadence blog from my old my mates at NPR devoted to a program we produced 14 years ago, as part of our ambitious Milestones of the Millennium series. And I do mean ambitious: We attempted nothing less than to “create a picture in sound of the pivotal events, places, movements, artists and musical works of the past 1000 years” through what amounted to a weekly documentary folded into our ongoing five-day-a-week production of Performance Today. Oh yeah, and also with “build outs” on this newfangled Interwebs thingy. High concept as hell, balanced by decidedly modest sales in the marketplace. Doubt anyone has the entire collection, but I was surprised to see that after being out of print for quite some time, Sony has now made a few of the titles available as MP3 downloads on Amazon and other sites. And you do see the odd CD copy for sale here and there. 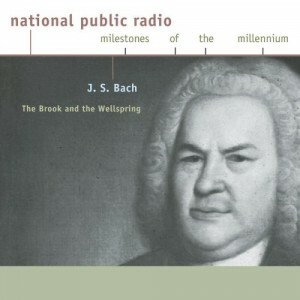 But, bac k to Bach: Of the entire two years’ worth of productions, this program on Bach’s St. Matthew Passion was one of the very best, hosted by NPR’s Lynn Neary and produced by Jeffrey Freymann-Weyr. It’s a “guided tour” through Bach’s St. Matthew Passion, with commentary from such luminaries as noated Bach scholars Christoph Wolff and MIchael Marissen, tenor Ian Bostridge, conductors Joshua Rifkin,Ton Koopman, and Kenneth Slowik, as well as soprano Ann Monoyios. Take a listen here. Revisiting one of our special evenings in the WGBH Fraser Performance Studio we called “Sonatas and Partitas” featuring pianist Simone Dinnerstein and Xuefei Yang, one of the first Chinese guitarists to play in the West…. One of the pieces by Carl Philipp Emmanuel that has never fallen out of favor in his native Germany is his Magnificat in D Major, a work that perhaps deliberately shares the same name – and even key signature – as one of J.S. Bach’s most famous choral works. It was composed in 1749, just a year before the death of Bach the father. And there is some supposition that the C.P.E. wrote this expansive work originally as an audition piece to succeed J.S. as the Cantor of St. Thomas Church in Leipzig. “Originally,” that is, because despite writing this Magnificat at an early age C.P.E. Bach revived this piece on several occasions during his career…and, like his father, recycled a lot of the movements into other sacred works of his. C.P.E. Bach III: A Double Concerto at the Crossroads…. A musical aesthetic associated with north Germany during the middle of the 18th century, and embodied in what was called the ‘Empfindsamer Stil’. Its aims were to achieve an intimate, sensitive and subjective expression; gentle tears of melancholy were one of its most desired responses. Archguitarists (what’s that?) Peter Blanchette and Elliott Gibbons bring down the house at our first-ever “Bach Around the Clock” event at First Lutheran Church in Boston. You can see the complete line-up and listen to the entire webcast here. Thanks to the amazing organist Balint Karosi of First Lutheran and the ever-energetic Joyce Painter Rice of the American Guild of Organists for making it happen!